I had a GREAT afternoon yesterday with my regular (club) stampin' ladies & a couple extra stampin friends! A perfect way to spend a Sunday afternoon! As usual, I took them 3 projects. I was too tired to post last night! I started to but crashed in mid process. But, I made it through tonight & here they are! First, was a Top Note Quilt card. There are many varieties of this going around right now, mainly because we have SOOO many great Designer Papers. And, don't forget they are on sale this month! Get one FREE when you buy Three! Card base is Riding Hood Red, stamped with the Tres Chic background in Riding Hood Red. The quilt look is done by punching (or cutting) 1-1/4 inch squares out of DSP, Candy Lane on this one, & arranging to form a 3x4 rectangle. Attach those to a base piece of cardstock that is 5 x 3-3/4. Note: Each package of DSP has 12 different prints. That is how I did mine-each of the 12 prints showing, arranged to look nicely together. Since each paper has a different print on each side, punch or cut 2 squares of each piece, and flip one over! Attach your squares to the base with a glue stick so that all the edges are caught nicely. The glue stick also gives you just a little "wiggle room" if you need to move one slightly to line it up. Let it dry just a bit then run it through the Big Shot and cut with the Top Note die. We added the Riding Hood Red Taffeta ribbon at the top, along with a Pink Pirouette Simple Flower (a Big Shot Embosslit Die). The flower was sponged with Riding Hood Red ink in the center & finished with a Jumbo 5/8" Very Vanilla Brad. The saying at the bottom is from the Oval All set in the Occasions Mini. It is punched with the Large Oval Punch & layered on a Chocolate Chip Scalloped Oval. Next, was a Window Sheet card. It scanned better than I thought, but it still looks better in real life! The card base is a Window Sheet. On that we stamped with White Stazon the stem image from Great Friend (in the mini). The outside White layer that you can see is on the inside of the card so you have something you can write on. The Riding Hood Red, Basic Gray & Whisper White are on the front. It was really a simple card!! After you score & fold your card, attach the largest Whisper White on the inside with Mini Glue Dots (they show less than Snail). You want to go just a little right of center as the ribbon will be on the left edge. Then you can stamp your stems on the front around the white. The Stazon dried very quickly! 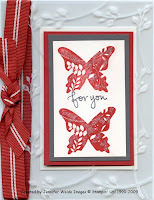 Stamp your butterflies & 'for you' on the smaller Whisper White. I also added some Dazzling Diamonds glitter using two-way glue on the butterflies. Just don't brush the glue around too much as you're applying-it makes the ink bleed! 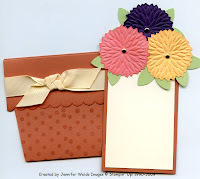 Attach your layers together and attach to the card front-lining it up with the Whisper White inside the card. Add the ribbon to the edge & attach the knot to the Window Sheet with a Mini Glue Dot. These colors really POP in real life. That was luck of the draw! I started with Riding Hood Red because that was one ribbon I had enough of. I added the Basic Gray for contrast & it made the card! 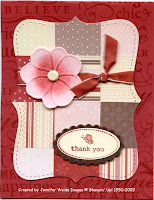 Lastly, was this flower pot card which has been going all around! It can be used for so many things. The pot is Really Rust, stamped with the Boho Backgrounds set. The Scallop Border punch was used on the edge with a little sponging of Really Rust. The flowers are made using the Big Shot & Flower Burst Embosslit in Elegant Eggplant, Cameo Coral & Apricot Appeal. The leaves are petals from the 5 Petal punch in certainly Celery Celery. Below is a picture of the two pieces that go together to make this work! The flowers are attached at the top of the insert. The pot is a made by taking a piece of cardstock, 3-1/2 x 9. Score at 2 & 5-1/2. Scallop punch the edge of the small piece, and fold that down to be the front rim of the pot. I did attach this down with just enough Snail to hold. Fold up the back piece to form the pocket for the insert & back of the pot. No adhesive required, the ribbon will hold it together. The insert is a piece of Really Rust 2-1/2 x 4-1/2 with a Very Vanilla layer 2-1/4 x 4-1/4. How I put it together: I attached the Cameo Coral & Apricot Appeal flowers to the top corners of the insert using a dimensional right in the center of each flower. Oops, don't forget the gold brads in the center first! The leaves can then be attached to the back of the flowers with Snail. I added the Eggplant flower last by reaching in behind the other two with a dimensional on the bottom. Again leaves as desired with Snail. Using a dimensional allows the flowers/leaves to "catch" on the pot when you inserted. The ribbon is the Wide Vanilla Grosgrain. The flower pot card is amazing!